TdF rolls on, and I think it’s day 13 but I am not positive. In the end, it matters little, as long as spinning time is to be had. Things at Chez Shells continue to be rather crazy and stressful. 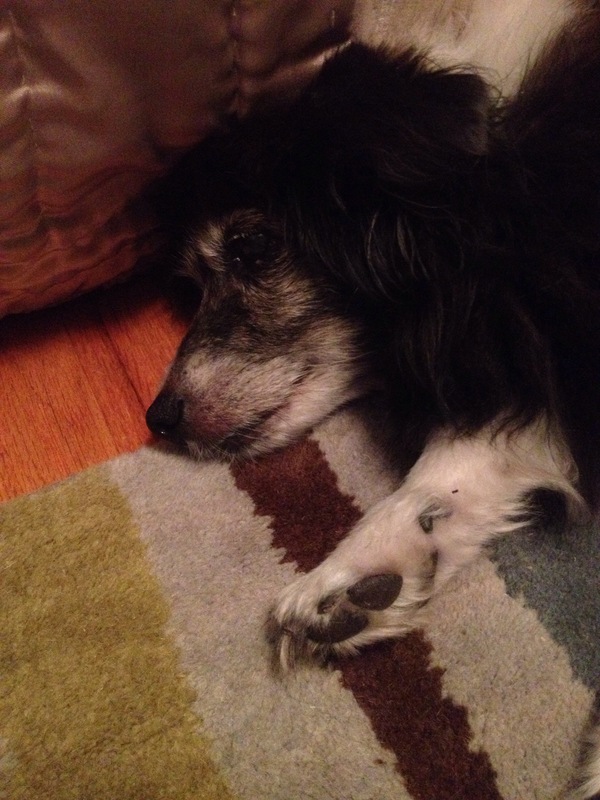 Now, along with the deadline of the old house clean out, we have a sick old dog. He’d been sick on Monday, but seemed to be recovering. Wednesday morning though, all went south again. Last night he went to the vet. Upon discovering he had a fever, he got anti nausea meds and a shot of antibiotics to start him off while we waited for his test results. In addition to an infection, he’s got pancreatitis, so he’s a pretty sad old dog at the moment. Mr. Ink and I were instructed to cook him a special diet, which we did last evening, and he goes on meds tonight. So, hopefully we’ll see an increase in comfort and energy levels soon. That being said, it really feels like my mind and attentions are being pulled in all sorts of directions. As for the old house update, we didn’t have much time to work on it yesterday due to regular Wednesday evening obligations and the vet trip. But, Mr. Ink got a small bit of sorting done while we waited on a couple to come pick up the futon and frame they purchased off us. One more large item we don’t have to move, a win for us! There was one other bonus that happened. Mr. Ink has a chair in the new house that’s lovely and colorful, but it needs a set of feet on it. It sits too low as is, and is scratching the floor. We’ve looked at hardware stores but not found anything that works. Well, as I was sitting in the basement with the junk that needs to go in the dumpster, I realized that I was looking at an ottoman, completely torn up and unusable, but with 4 perfect feet. I asked Mr. Ink if they’d work, and upon investigation, it seemed that they would. And just in case they would not, we grabbed the feet off another chair headed to the dumpster as well. Recycling for the win! I did get some spinning done last night though, TdF wasn’t completely neglected! And I also managed to get out and do some garden weeding and flower deadheading. There were certainly some plusses to an exhausting evening. 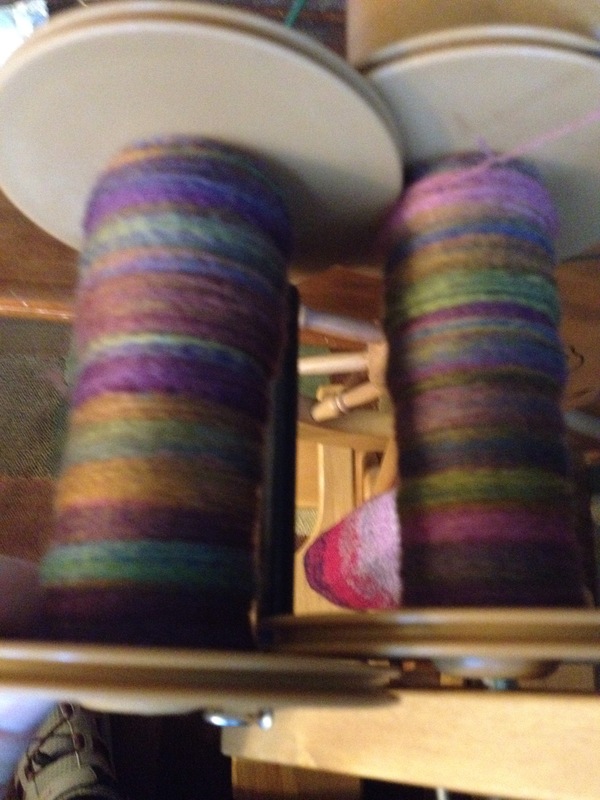 I started a second bobbin (sorry for the blurry pic, it was very early morning and not a lot of light.) And, I’ll get more time at lunch today to do some spindle spinning of this same project. It really is a beautiful one! When I am staring down a deadline like this, I get so involved, so motivated, and I move so fast, and make decisions so quickly. The foot problem was solved ONLY because I ran out of things to do and was forced to sit quietly and look around me. Another good lesson for me, to consciously take a break from time to time and survey that which I am surrounded by. Best wishes for your pooch. I’m always devastated when mine go there, so I can imagine you’d be pretty exhausted with all that’s going on! Thank you so much. He’s 17, so I’ve been sort of expecting that we’d see a downhill spiral at some point in the near future. Maybe it’ll be an easy recovery, but I have some suspicion that this might be his body starting to give out. As you know, a sad time in any household. My usual optimism isn’t holding up as well as it generally does, probably due to stress. However, with the looming deadline I will be, at least, well distracted. 17, that is amazing – he has lived a good life!